I’ve never subscribed to the idea that writing is a solitary profession. (The notion is all part of the romantic idealism fostered, way back, by the Pre-Raphaelites, taken up by Wilde, Swinburne, Pater and that crowd, and carried into the mid-twentieth century by Wolfe and her ilk. It goes hand in hand with those other untruths: that one should suffer for one’s art, and that writers are prone to ‘blocks’). I’ve had jobs which are for more lonely than that of a freelance writer. Try working a night-shift in an empty Youth Hostel, for example, or as the sole despatch clerk in a cavernous warehouse. My working day starts around nine, after I’ve walked the dog and nattered to fellow dog-owners. I write for a couple of hours, then take the importunate hound out for another constitutional. After a quick lunch, I do another two, two-and-a-half hours, and that’s the writing day done. By then my daughter is home from school, and a little later my wife arrives home from work. I rarely write at the weekends these days, so Saturday and Sunday I lead the life of a relatively normal human being. It’s not a lonely life. As for suffering for one’s art, or craft… I favour the down-to-earth pragmatism of the northern school of writers of the ’fifties and early ’sixties: writers like Sillitoe and Barstow, Hines and Storey, etc. They were working-class writers whose subject was working-class life, and they were grounded in an (often) protestant work-ethic and the northern ethos of ‘not getting above thee self’. To them, writing was a job of work; you got on with it without fuss or palaver, and certainly without the immodesty of assuming that your words were immortal. If you like, they endured conditions because that was what fate had handed them, and then they wrote about it. Which is a long-winded way round to getting to the point: writing certainly isn’t a lonely profession when you’re the creator of what will become a shared world: in my case, Weird Space. Way back in 2010 Jon Oliver at Abaddon Books approached me about creating a background universe for a series of action adventure space opera novels. There were to be strange cults, aliens, telepaths, and Lovecraftian monsters from another dimension. I melded these into a far-future human-based expansion, ruled by a fascistic government which kept a draconian militaristic control on the many planets within their domain. Next door to the Expansion space is Vetch territory. The Vetch are bellicose aliens who, before the series opens, ethnically-cleansed an area of human-inhabited planets in Vetch space. But beyond Vetch space is the Devil’s Nebula, where the Weird – the aliens from another dimension – first manifest themselves. The Weird are not only weird – creatures who come in many and various monstrous forms – but they’re implacable and out to ‘consume’ the human race, invading worlds via portals from their dimension. 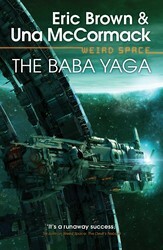 Part of the fun of writing the first two novels of the series was creating a fascistic human regime and having the central characters coming, in due course, to accept that to defeat the Weird they must work together – and the same will be true of the humans and the Vetch: in following novels they must put their hostilities to one side and co-operate. How could the profession of writing be lonely when I created a universe and handed the creative baton on to a writer as accomplished, and innovative, as Una McCormack? We had a couple of meetings before Una put pen to paper, fleshing out the background, discussing possible directions the story could take, and contemplating plot-lines. The fourth book, by Una, will follow on from the characters and action of third – and I for one can’t wait to see in which direction she takes the story of the Weird. And after that, Una will hand the baton on to another writer, who will bring his or her creative ability to the nasty, vicious, far-future that sprang into being in my head over five years ago – and I hope, in some way, to be involved in these future novels. Who says writing is a solitary profession? A part of me, as I typed the above, felt a sense of guilt. It’s received wisdom these days – and, for all I know, always has been – that a fiction writers must assiduously research the background to their works in order to present a credible ‘world’ to their readers. After all, if you’re writing about a World War II fighter pilot, isn’t it wise to have read up on what it’s like to be a fighter pilot? And that goes for any other specialist profession or area of expertise, of course. To lend greater fidelity to one’s visions, research is essential. Over the years I’ve become so averse to doing any research that I think my subconscious filters out – at a very early stage – any nascent projects that might require research. So that what’s left, what rises to the surface of my consciousness, are projects which require no prior reading at all. I’ve read loads of baloney about “Doing Your Research”, usually in writing manuals, or online – articles which encourage the beginning writer to research aspect of what they’re writing about. This is all very well if you’re writing a historical novel, but even so I’d much rather encourage a writer to concentrate on more important aspects of fiction than factual verity – psychological fidelity, say, and the importance of plot mechanics. For most novels research – if needed at all – is something that can be done when the important aspect of a book, the story and characterisation, are in the bag. Don’t put the cart before the horse. Of course, when I’ve finished a couple of drafts of a novel, I’ll check a few facts. But the odd things is that I find, on looking back at the process of writing a book, that in many cases I’ve scored the red pen through these facts, having found that they’re not germane to the tale I’m telling. Now… all the above is not to say that research is necessary in some cases, but I am saying that be careful not to over-research and laden your novel with indigestible wodges of fact. I often wonder at my disinclination to do research, and I think it’s something to do with my aversion to what is perceived as ‘fact’. What matter to me are not facts, but the truth as perceived by me, the author, and by my characters. I harbour the desire to one day write a short story in which everything in the tale is ‘wrong’: the facts are wrong, the physics are wrong, the science is wrong, even the grammar is wrong – but the whole adds up to a startling, shining truth. I’ve been thinking about this on and off of the best part of thirty years, and I still haven’t worked out quite how I’ll achieve the feat. This piece first appeared on the Rising Shadow website.